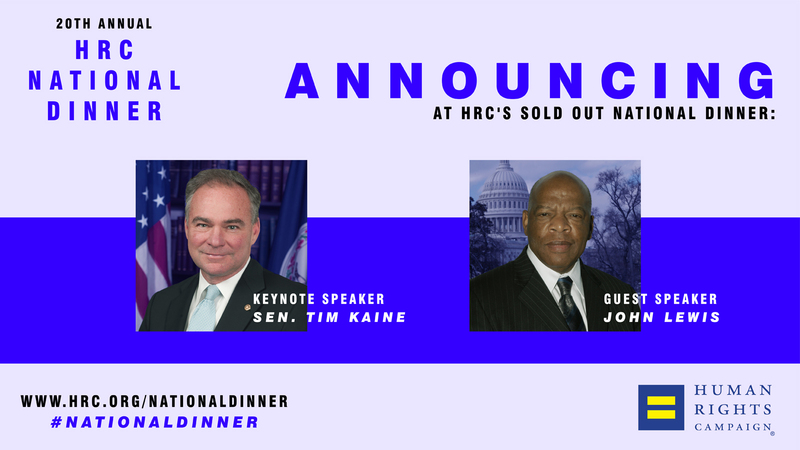 Today, HRC announced that Democratic Vice Presidential Nominee Senator Tim Kaine will deliver the keynote address at the 20th annual HRC National Dinner onSaturday, September 10, 2016, in Washington D.C. Civil rights icon and Congressman John Lewis (D-GA) will also speak at this year’s sold-out event, which will take place at the Walter E. Washington Convention Center. Kaine has a strong commitment to LGBTQ equality. In addition to supporting marriage equality, Kaine is an original co-sponsor of the Equality Act -- federal legislation that would finally guarantee explicit, permanent protections for LGBTQ people under our existing civil rights laws. One of Kaine’s first actionsas Virginia Governor in 2006 was to sign an executive order adding sexual orientation protections to the non-discrimination policy for state workers. Kaine also recently signed onto an amicus brief in the 2nd Circuit case, Christiansen v. Omnicom Group Inc., arguing that sexual orientation and gender identity discrimination are prohibited under the Civil Rights Act of 1964. He has voted in favor of the Employment Non-Discrimination Act (ENDA) and co-sponsored the Student Non-Discrimination Act (SNDA). Lewis is a longstanding champion for LGBTQ equality. He is an original cosponsor of the bipartisan Equality Act. He has a perfect 100 rating on HRC’s Congressional Scorecard and, among other things, is also the lead sponsor of the Every Child Deserves a Family Act, which prohibits any child welfare agency receiving federal financial assistance from discriminating against any potential foster or adoptive family on the basis of sexual orientation, gender identity, or marital status. Donald Trump and Mike Pence have put at risk all the progress on LGBTQ equality made under President Obama. Trump has pledged to appoint Supreme Court justices who would overturn nationwide marriage equality, and supports vile laws like North Carolina’s HB2. Pence became a national disgrace in 2015, for his “license to discriminate” bill that could have allowed businesses to deny service to LGBTQ people -- and for subsequently defending the bill after an outcry from the business community and a majority of Hoosier voters.